There are few things more satisfying to a homeowner than having a beautiful green lawn. But if you're like thousands of other Arizonans who opt for sod rather than traditional desert rock landscaping, you'll want to make sure you're installing it correctly. Here's how to prepare soil for sod to ensure you end up with the desired results. Test the soil: Not all Arizona sod is the same, so you'll want to make sure you purchase the right type based on alkaline content of the existing soil. This is achieved by testing the soil's pH level with a kit from your local garden center. Install or prepare sprinklers: Naturally, fresh sod is going to require maintenance and regular care; therefore, a sufficient irrigation system is the key to success. If your yard is already equipped with one, mark each sprinkler head with a flag and be cautious not to damage them when you attempt step three. 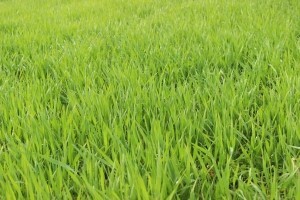 Remove grass and weeds: This is the most important step of which to be mindful as you learn how to prepare soil for sod. In order for sod placement to be successful, your yard must be completely cleared of grass, weeds, rocks, twigs, and debris. - The first step to this is killing existing vegetation with either chemical or organic products such as Roundup or homemade vinegar-based solutions. - Secondly, clear the vegetation and rake up additional debris so that there is nothing left to physically interfere with sod installation. Consider grading: If your lawn is flat, be sure to build up soil around your home and other structures to prevent water from pooling. Your goal is for the yard to slope slightly to avoid overwatering. Spread topsoil: This is not always mandatory, but adding soil amendments to your lawn can help with sod's ability to root and gain proper nutrients for growth and sustainability, which is of particular importance in Arizona's desert climate. Water the ground: As a final step, dampen the soil just before you are ready to install sod (which should be laid as soon as it is purchased/delivered). Do not create mud puddles; rather, give the soil a quick once-over with the hose to lightly moisten the surface. It's as simple as that - now you know how to prepare soil for sod. Although the steps are not necessarily difficult, they can be time consuming depending on the size of your yard. Dedicate the proper time for soil preparation and before long, you'll have a lush landscape to call your own.